VATICAN CITY -- After the introduction of Vatican Air and Vatican TV, the Vatican has recently announced a new gaming division: Vati-Game Inc. The first game unveiled this past weekend at VatiCON, the official Vatican sponsored media conference, is called Roman Missal Command. The game objectives are simple. 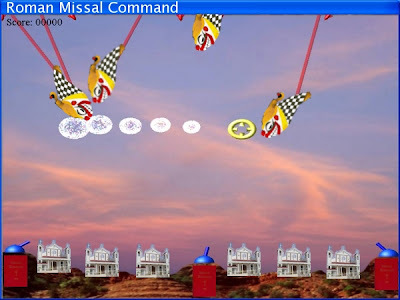 Defend the churches and the liturgy from certain liturgical abuses, which come in the form of clown rockets, by using the Roman Missal as your counter to the clown rockets. Roman Missal Command is receiving full backing from the Pontifical Office of the Liturgical Police. Father Ronson, Director of the Liturgical Police, says that "the Game is just what our age needs. Wholesome. Theological. Biblical. Catholic. There isn't anything more a person can ask for in a game." Opponents of the game have been calling it unecumenical and have been attacking it for its lack of emphasis on social justice and questioning whether or not it is a just war-game. Blow is a screen capture from the game made available from the Vatican gaming division. Game is due some time in the Spring.